Ruthie’s Challenge: Weave a Tapestry. 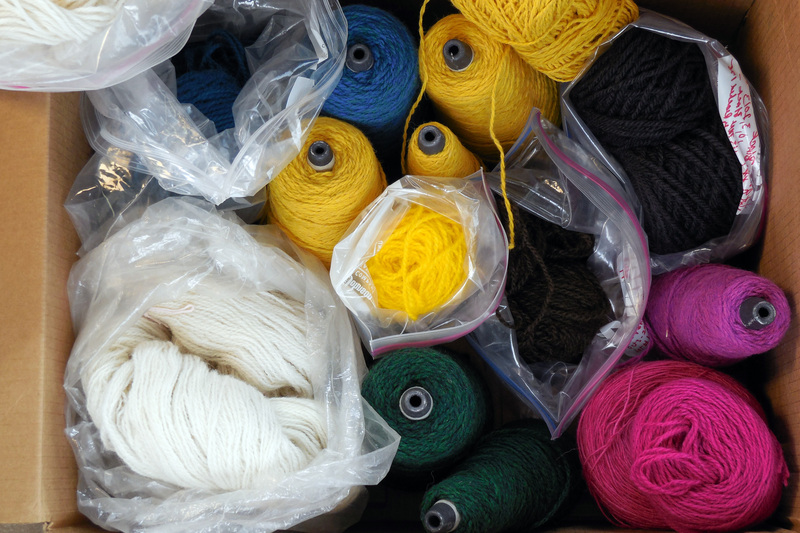 Here is a box of wool yarn. Let’s see what you come up with. Recently, my sister Ruth challenged me to create a wool tapestry on a cut length of linen warp she picked up at a sale. Since I have not yet worked with wool and have none in my yarn cache, she sent me collection of colors from her own supply. Whether my piece will be a rug or wall hanging remains to be seen. The size will be approximately 24” x 48” (2 feet by 4 feet for those of you who don’t wish to do the math). Linen Warp SETT: Five warps per inch. 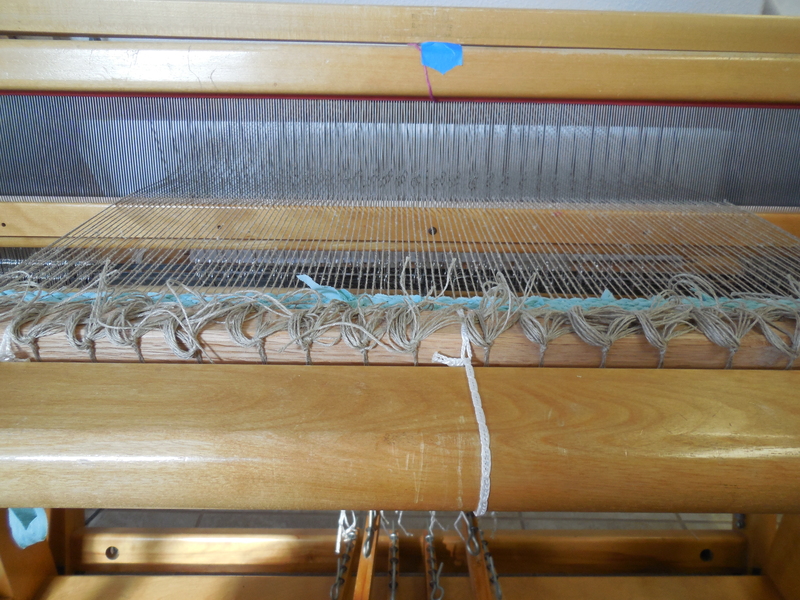 The warp is on the loom – taut and ready to weave. (The warping job was made easy by my new trapeze.) I have created a design and drawn a ‘cartoon’ or plan for the pattern, so preparation for this project has been completed. As I was about to begin weaving my first major tapestry project, I realized the little “butterfly” wads of yarn used to weave a colorful design will drive me nuts. I can make them well enough, but they refuse to keep their shape and come unraveled all over the place. Pieces cut and sanded. Construction begins. If the fit is loose, a thread or two is inserted to tighten it up. It is my belief when one is doing exacting work, frustration should be avoided at all costs. 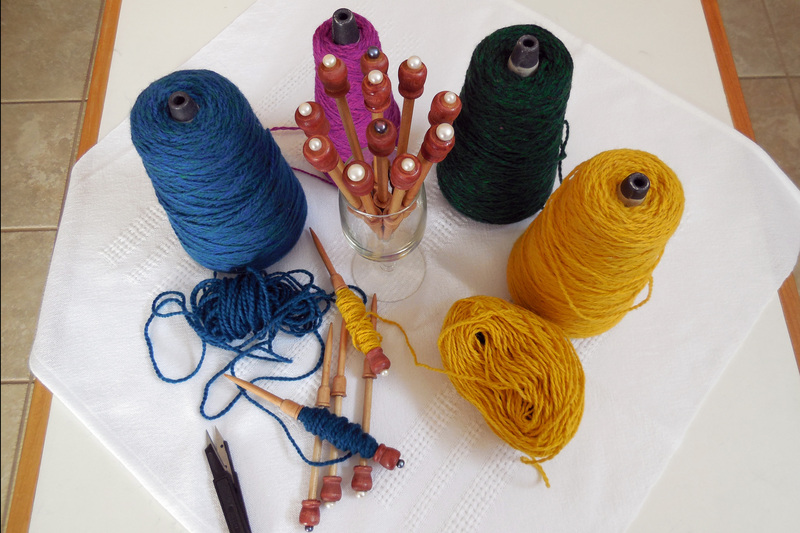 So, I consulted the ‘net’ about tapestry bobbins. They come in two sizes and measure approximately 4 inches or 6 inches. For this size project, I decided to go for the 6 inch size. 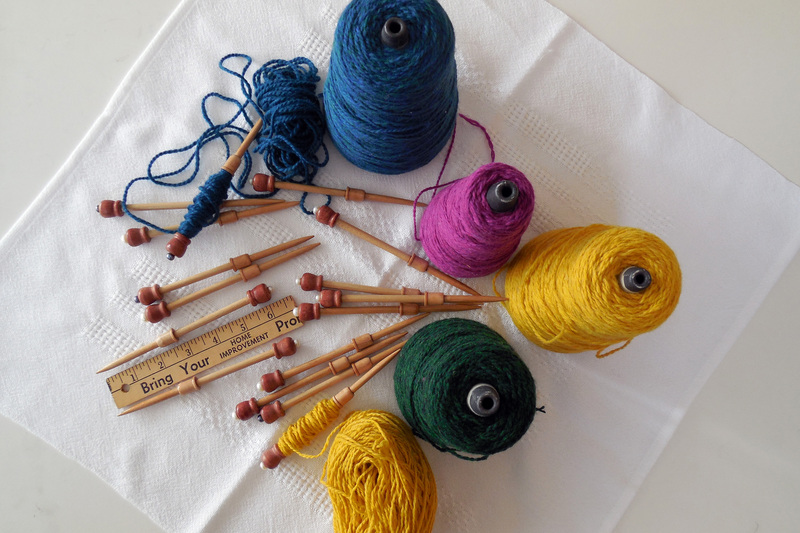 A trip to the wooden dowel department of our local hardware store convinced me I’d be much happier if I made my own wooden bobbins – and I could do it for about the same cost of the plastic ones. – 2 hardwood dowels, size ¼” x 48” and a cost of 45 cents each. At 6” each, this will make 16 shuttles. More than enough. With a little help from a small hammer, the dowels can easily be cut with a sharp knife, and then shaped to a point by sanding. 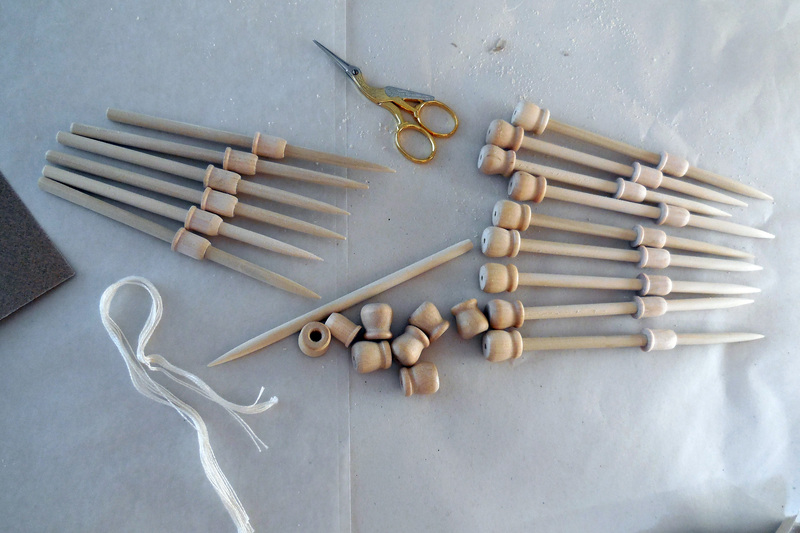 – 16 wood pieces with a hole through each and flanged on both ends will work as yarn stops. One flange will have to be removed so they won’t hang up on the tight warp. With an Exacto knife (which I had at home) I’ll cut the excess wood away and sand of the sixteen tiny pieces so they slope toward the pick. – Sandpaper for wood. All the sandpaper I had at home was for metal and would not work well for wood. – A finish for the wood. It will seal the wood and perhaps darken it a little. This cannot be oily since any residue would transfer to the yarn. I would add water color from my art supplies to the clear water based product I chose. I hurried home to begin construction. In my former life, before arthritis made it difficult to impossible, I worked with precious metals. Over the years, I collected stones and beads of all sorts. In my inventory of gems, I found a cache of cultured pearl buttons. Perfect for trimming the tops of my bobbins. Bobbins Finished. Now, I’m ready to make a Tapestry. The project is completed. I have a good supply of attractive bobbins and can begin the weaving satisfied my yarn will be carried to its destination in style. PS. The square cloth under the finished bobbins is the huck curtain warp end. There was just enough left of the white warp to make this one small square piece. Luckily, I made a warp of eleven yards instead of ten.